All New Yorkers...read this one. It will change your life...okay that's a little dramatic but seriously, amazingness ahead. 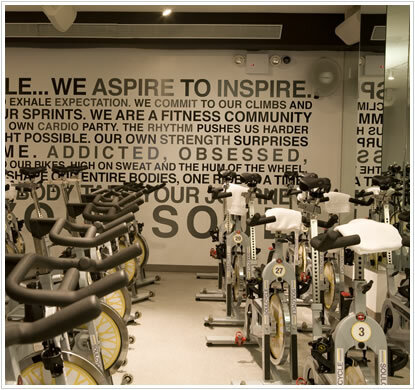 Last year a little spin studio opened in Tribeca close to where I live and it started an obsession/love affair that is still going strong today. That studio is called Soul Cycle! Now, I am NOT a spin person...or so I thought. Usually during a spin class I'm counting down the torturous minutes until the 45min or hour is over. I go home irritated...leg's shot. 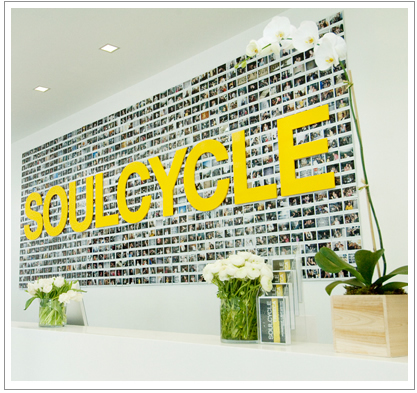 Enter Soul Cycle. This class is RIDICULOUS. Just ridiculous. I mean...one of the most intense experiences ever. It's 45 minutes of the sweatiest, fun, crazy, intense, power workout you can get in NYC. At least that I've ever experienced (I'm too chicken to try another full Bikram class...that's another post, another time). Literally, during a Soul Cycle class the lights are out, music is blasting, and you are bouncing all over your bike. I probably look totally ridiculous....but I'm in rock-out heaven. AND it's dark, so who cares! Don't think you're getting just legs because this puppy works your arms (the arm song is killer) and core. So...if you're looking for some soul, I'll see you on the bike! Can we find your picture on the wall? Terrific workout!